Very good premise. very interesting, was always looking forward to it, never knew what to expect. We need to keep edgy original shows on the air, The audience eventually comes around. Please save. i enjoyed 1st season please bring it back! 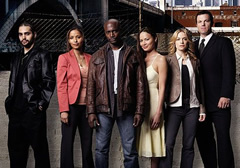 storyline was more easy 2 follow and that i like taye diggs so please bring it back! Day Break Rules. Just SAVE IT!!!!!!!!!!!!!!! My brother told me about this show. We bought the DVD set. It was so compelling that i watched it in one straight sitting. It really would be worth bringing it back, as it seems to have a fairly strong and vocal following. Really was an entertaining tv show. don´t end with day break.day break is a really good serie. Finally…something different…a show that’s not the same old same old…and you take it off the air!!!! Is it truly lack of interest …or…is it just that you didn’t give this show a chance to become established with viewers. And Taye Diggs? What can I say? He’s awesome and believeable in that role. Come on ABC…find a way!